Sympathetically converted 19th century barn with stunning view over large fishing/ wildlife pool. The accommodation is comprised of a large well equipped dining kitchen, comfortable sitting room, 1 king-size, 1 double and 1 twin bedroom each with ensuite bathroom. 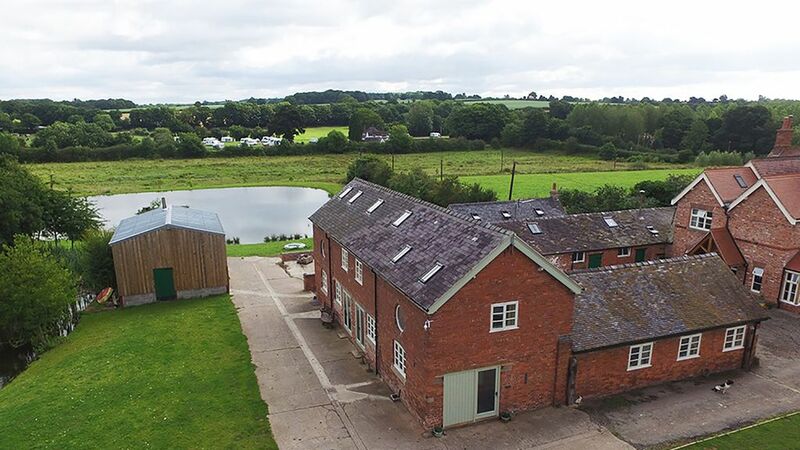 The barn benefits from Biomass central heating ( underfloor on the ground floor ), large range cooker, dishwasher, washing machine,fridge freezer and 5 freeview TVs including 1 42" smart TV with DVD player, and WiFi. The property which sits within the owners smallholding is named after Clive of India, one of Shropshire's most famous descendants. It is ideal for families and couples who are looking for a relaxing break in one of England's prettiest counties. It is well located for exploring Shropshire's many delights as well as Cheshire, Staffordshire and even North Wales. The Shropshire Union Canal is nearby and walkers and cyclists will find plenty to explore. After a day spent exploring all the area has to offer the local pub which is only 1/4 mile away offer food or why not use the BBQ provided and relax by the wildlife pool watching the ducks and geese. Perfect venue for spending quality family time! Aa a family of 6 adults with 2 babies, we had a brilliant family weekend! Thank You Lyn & family. The Clive barn was well equipped, spacious & beautifully furnished! We couldn't have asked for more! We hope to return again soon! We all really enjoyed our weekend. The barn conversion was beautifully appointed and furnished. Owner really friendly and nothing too much trouble. Thank you for your kind review, it was a pleasure to meet you and we are so glad you enjoyed your stay. Absolutely loved it.... big family gathering over new year, but we never felt on top of each other... due to the massive well appointed kitchen and nice spacious lounge. You also have downstairs loo.... plus each bedroom has an en-suite!!!! Really tastefully done and set in great location, pleasant walks alongside canal and 5 minute walk to local country pub. Thank you for your kind review Steve, we are glad you enjoyed your stay. Hopefully we will see you again and you will be very welcome anytime. We loved the area and the accommodation was great. Well equipped with everything we needed and especially enjoyed having an ensuite with each bedroom! Very comfortable, warm and just a lovely place to spend a holiday. Bread, milk, eggs etc on arrival very much appreciated and we had a great meal at the local pub, The Wharf Tavern, down by the canal. Thank you for a great stay, we will definitely recommend and would like to come back some day. We had a great week staying in the Clive Barn. Lyn and Mark were welcoming and friendly. The children loved watching the sheep, dogs, ducks, guinea fowl and, most of all, the cockerel. Would love to return some day. Well located for exploring Shropshire, Cheshire, Staffordshire and North Wales. The Shropshire Union Canal is nearby and walkers and cyclists are well catered for in the area with The Wrekin and Long Mynd. Places of interest within easy driving distance include The Potteries at Stoke-on -Trent, medieval Shrewsbury, Ironbridge and Hawkstone Follies. There are several National Trust properties within easy reach including Sunnycroft, Attingham Park, Shugborough and Little Moreton Hall. Chester Zoo and The Blue Planet Aquarium are both within an hours drive as are Alton Towers and Drayton Manor.